You can add a landing page, as well as forms and automated emails to support your event. These resources are automated, using templates based on your company profile and the information from your event details. When you create a landing page, you are setting up a web page that also includes a form. The landing page form will help you automate collecting sign ups for your event. When a contact fills out an event form from the landing page, the contact’s status gets set to “Attending,” which will automatically send the booking confirmation email if you have activated that resource. Upsales will also create pre-tracked links for you to share the event landing page on social media. After the event, the statistics for these links are available on the event dashboard. On the Event Planning page, select Add next to Landing pages & forms. Use the Editor in the right panel to change the landing page style and content for text, image and button blocks, similar to editing other Upsales templates. 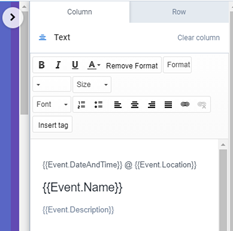 Note that event details are shown in the preview, but in the Editor, the details are represented with dynamic tags. You can add additional tags using the Insert tag button. The countdown block uses the event date from the event details. You can click Select another date to enter a new date for the landing page countdown. Or click Select event date to return to the date you entered for the event details. Select the form block to define the form for this landing page. Similar to creating a form, the form properties are on the right panel, and you can preview the form with the landing page on the left. On the form block in the preview, select the Thank-you page tab to define what displays after the contacts submits the form on the landing page. Select Image, Video, Text, File download, Button or External page to define the content that displays after the contact submits the form. You’ll provide additional information about the content, depending on the type of content you selected. You can select Clear Column to choose a different type of content. Select Save and return to event when you’ve finished setting up the landing page. The landing page is listed on the Event Planning page, with options to visit page, copy the URL or open the landing page to edit it. You can also delete the landing page if you want to start over. You can only add one landing page. Forms help you automate collecting sign ups for your event. You can place the form on your website or anywhere online. When a contact fills out an event form, the contact’s status gets set to “Attending,” which will automatically send the booking confirmation email if you have activated that resource. Use the Editor in the right panel to change the form details, actions, fields, and style, similar to editing other forms. Select Save and return to event when you’ve finished setting up the form. The form is listed on the Event Planning page, with the option to publish the form or open the form to edit it. You can also delete the form if you want to start over. You can add multiple forms to support this event. Just select Add next to Landing pages & forms on the Event Planning page to repeat the process for a new form. Upsales events include predefined emails based on when the emails are sent and to whom. These email templates save time and contain all of the event details you entered on the details tab as dynamic links. But you can also fully customize the design and content of these emails. On the Event Planning page, select Add next to Automated emails. Change the email template name, sender, subject and preview text, and add attachments, if desired, similar to defining the email for other email campaigns. Use the Editor in the right panel to customize the template, similar to customizing other email campaign templates. Select Save and return to event when you’ve finished setting up the automated email. The email is listed on the Event Planning page, with the option to open the email to edit it. You can also delete the email if you want to start over. You can add multiple automated emails to send under different circumstances. Just select Add next to Automated emails on the Event Planning page to repeat the process for a new email.